Now getting new brakes can help children who are facing real life and death circumstances. The Children’s Miracle Network is a life line to local hospitals like Albuquerque’s UNM Children’s Hospital. UNMCH services the greater New Mexico region and provides life saving medical treatments to children who might not otherwise receive care. 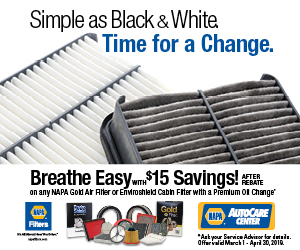 It is NAPA AutoCare Center’s pleasure to build awareness and raise money to help such a worthy organization. This donation is made possible by NAPA Parts, NAPA Brakes and your neighborhood NAPA AutoCare Center. We look forward to making this campaign a great success. When it comes to preventive maintenance and vehicle care, most Albuquerque drivers know how important it is to check their brakes. But brakes are more than just brake pads and shoes. There are a lot of components in the brake system, and they all need to be in good working order. The pads and shoes are known as the friction materials in the brake system. They push together, providing friction which stops the vehicle. It’s no wonder they have to be checked regularly for wear, and brake pads and shoes need to be replaced periodically. But your braking system also has mechanical parts. These pistons and springs can also gradually wear out or get gummed up by oil, dirt and other road spatter. A brake inspection at your neighborhood NAPA AutoCare in Albuquerque includes a check of these parts as well as the pads and shoes. Your friendly and knowledgeable pros at your NAPA AutoCare can then advise you of any parts that need cleaning or replacement. Fluid to the brake system needs a regular check-up at your neighborhood NAPA AutoCare as well. The brake fluid cools and protects your brake system. Protective additives are gradually depleted by the operation of the brake system, and moisture buildup inside the fluid can diminish its effectiveness. When you have your brakes serviced atyour neighborhood NAPA AutoCare in Albuquerque, the fluid should be checked and, if needed, replaced, which will clean out water, debris and dirt. It is important to remember that your brake system also includes your tires. No matter how well your brake system is performing, if your vehicle tires are worn, you won’t get good stopping power. Traction is the power of your tires gripping to the roadway. Traction is always better on tires with a good tread. Good traction translates to good braking.